Euromotive's first all electric conversion is based on an LDV EV80 high roof panel van with its higher energy efficiency, stronger power, ZERO EMMISIONS and enhanced eco-friendly performance. 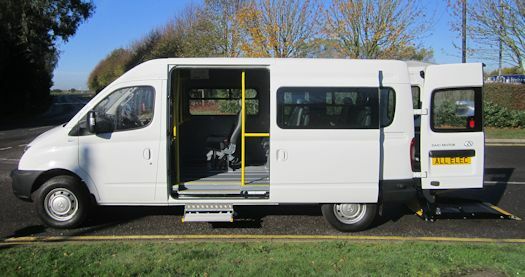 the vehicle has been converted into a 8 seater accessible vehicle with a sliding door entrance and underfloor cassette step to aid with entry and exit from the vehicle. the vehicle also has rear access for wheelchair users by way of an inboard tail lift. The interior of the vehicle is ply lined and trimmed in smooth carpet, the floor is also ply lined and then covered with an anti-slip flooring. The floor tracking is tested to comply with M1 standards and a certificate of conformity and supported documentation from tests successfully carried out at MIRA and witnessed by the VCA is supplied with each vehicle.